The GLBT Community Center of Baltimore and Central Maryland is celebrating the beginning of Pride month with Baltimore’s official Pride festivities June 15-17. This year’s theme is United We Shine, which according to organizers represents transforming fear into empowerment and celebrating commonalities and differences in the community. In 2017, about 30,000 people attended. 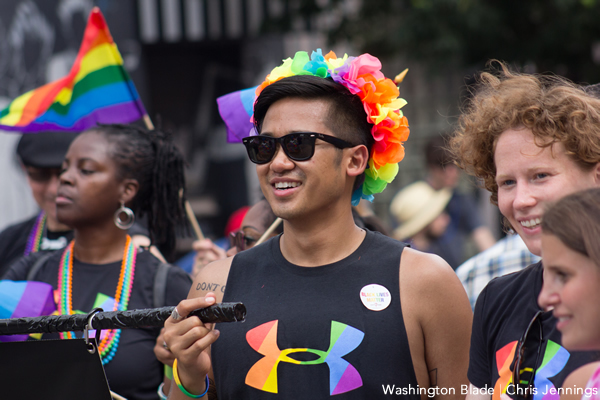 The official Pride events directly benefit the center and will help fund more than 40 programs that serve around 800 sexual and gender minority individuals every month in Baltimore. The festivities begin Wednesday, June 13 with Wine’d Up Wednesday at Flavor (15 E Centre St.) from 6-10 p.m. There will be a wine tasting, hors d’oeuvres and a silent auction. The Maryland LGBT Chamber of Commerce is sponsoring the OUTNetworking Loft on the third floor. Tickets are $40 in advance on Eventbrite and $45 at the door. The center’s annual benefit evening Twilight on the Terrace is on Friday, June 15 at Gertrude’s at the Baltimore Museum of Art Sculpture Garden from 7-11 p.m. Guests can dance, eat and drink craft cocktails from Gertrude’s and Hendrick’s Gin. Special guests include emcee WJZ-TV anchor Jessica Kartalija, Baltimore City Mayor Catherine Pugh and Gertrude’s owner and chef John Shields. Performers include Baltimore Pride parade grand marshal and “The Voice” finalist Davon Fleming and Miss Gay Maryland USA Summer Knight. Tickets are $125 on Eventbrite. The Rainbow Lot, formerly known as the Lez Lot, will be open from 11 a.m.-8:30 p.m. In the parking lot behind Graffiti Alley (1915 N. Howard St.). Food trucks such as Jurassic Pork and Kona Ice will be stationed. Tickets are $20 on Eventbrite. The Pride Parade is on Saturday, June 16 from 1-3 p.m. The parade begins at N. Charles and 33rd St. next to Wyman Park, proceeds 11 blocks, and ends at N. Charles and 23rd St. There is a viewing stage on the corner of N. Charles St. and 24th St. in the Brown Rice parking lot. Following the parade, the Pride Block Party begins at 4 p.m. at Station North, with a pre-show at 1 p.m. TT the Artist, Miami TIP and Taylor Bennett headline the event. Davon Fleming, Garek the Queen, Rue Pratt, Kotic Couture will also perform. The Pride Festival is Sunday, June 17 from noon-6 p.m. In Druid Hill Park. The festival is family friendly and there will be music and entertainment, a drag stage, exhibitors and local food trucks. Featured performers include Tish Hyman, Kourtney White and Spykey Van Dykey.